Here is a sneak peek at the official transcript from Crochetville’s live chat with crochet designer Pam Daley that took place on our Facebook page on Friday, November 2. We had so many questions that I’ve had to divide this blog post up into multiple parts. Links to all the parts can be found at the end of this post. We hope you’ll join us on our Facebook page for future chats with more of your favorite crochet designers. 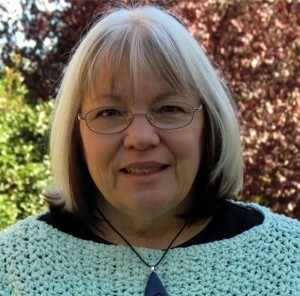 Crochetville: Let’s give a big welcome to Pam Daley, our special chat guest today. Pam, thank you so much for taking the time out of your busy schedule to join us today. Pam Daley: I’m excited to be here! Thank you for inviting me. Crafts & Things Pam! Sorry, I missed the first few minutes. Karen: Hi Pam, do you have any suggestions on how to get started selling things? thank you! Crochetville: Pam, can you tell us a bit about how you got started on Etsy? Pam Daley: Sure! I opened my first Etsy shop in December 2007; my hubby and I had retired earlier that year and my goal had always been to find a part-time career I could “take on the road” when that day came. I’ve been crocheting since I was a little girl and had recently taken up my hooks again while going through chemo. I had a light bulb moment and realized I wanted to try to turn my love of crocheting into that mobile career. A friend turned me on to Etsy and I opened my first shop – it was called The Crocheted Baby. I had just become a grandmother and my focus was on baby stuff. But as my business grew I found that the name was no longer really accurate, so I decided to change the shop name to Playing with Fiber. At that time Etsy didn’t allow you to change your shop name, so I started over with this new shop in February 2009. Pam is a full-time RVer temporarily living in a “stick house” while her hubby recovers from a motorcycle accident he had in August 2012. She has been crocheting forever, and ‘officially’ designing her own patterns since 2007. She has over 80 self-published designs and has recently started offering custom made photo stitch markers for crocheters. Pam is an Associate Professional Member of the Crochet Guild of America and addict of Facebook , Crochetville member, & Ravelry member. You can find Pam’s website at Pam Daley Designs. Her blog is there as well as all of her patterns and stitch markers.